Hello again, my stamping friends! Well, did you make it through ‘April Fool’s Day’ unscathed, or did you get pranked by a friend or co-worker? How about those elaborate hoaxes put on by big companies – the selfie shoe? all countries reverting back to using Fahrenheit temperatures? I think my son’s favourite is Google enabling the PacMan game on their maps!! Well, we’re all safe for another year! 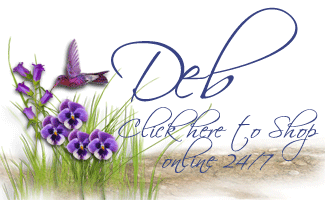 I kept a low profile, and stayed at my crafting table 🙂 We have an upcoming Creation Station Blog Tour this weekend (I hope you’ll come back & check it out! 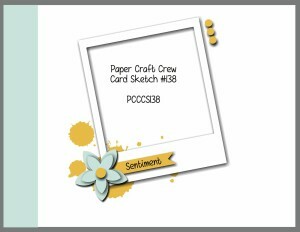 ), and I also have a new card for the newest Paper Craft Crew challenge – PCCCS138. I just love this newest photopolymer stamp set called Just Kidding! It really appeals to my sassy side (no comments from the peanut gallery out there!) and I love the comic ladies in this set. I decided to start with basic black and white; a Basic Black cardstock base, Whisper White panels and some fabulous Back to Black Designer Series Paper. I stamped the lady in Memento Tuxedo Black ink, and coloured using Stampin’ Write Markers in Melon Mambo, Soft Sky, Lost Lagoon, Daffodil Delight and a bit of Old Olive for the grass. This sentiment is actually laid out differently on the stamp; to make it fit the space, I simply inked the parts of the phrase I wanted, stamped them, cleaned the stamp, then repeated until it was all done. I punched the flowers using my Petite Petals punch, retired Itty Bitty punch, and the 1/8″ punch, in Melon Mambo and Soft Sky cardstock, and layered them. 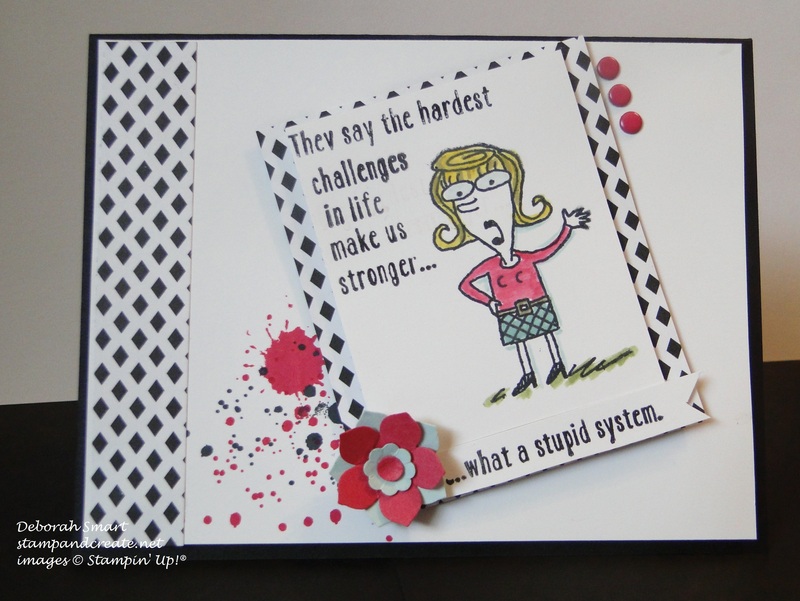 The ‘splatters’ in the background are made using both the Perpetual Calendar and Gorgeous Grunge stamp sets, and Melon Mambo and Memento Tuxedo Black inks. I do hope you’ll head over to the Paper Craft Crew page – there’s such amazing inspiration from the design team, as well as the other cards submitted for this challenge. While you’re there, you can also vote for my card for challenge #137 – my card is #6. Thanks in advance! That’s it for now! Have a great day, and until next time – happy stamping! Previous Previous post: Thank You, Weekly Deals, Final Day of Saleabration! Next Next post: FREE SHIPPING – APRIL 6th – 10th! Wasn’t that selfie shoe hilarious, Crystal?! Too funny – maybe that’s why I was in the mood for a fun(ny) card yesterday! So glad you liked it, and thanks for your awesome inspiration on the Paper Craft Crew design team! This is so cute Deborah. I really like this stamp paired with the Black and White. Thanks for joining us this week at the Paper Craft Crew. Such a cute, cute card. I’m thinking I will have to get this stamp set. Love it! Thanks for such a nice comment, Marty! I’m glad you liked the card 🙂 I really enjoy the Paper Craft Crew challenges.